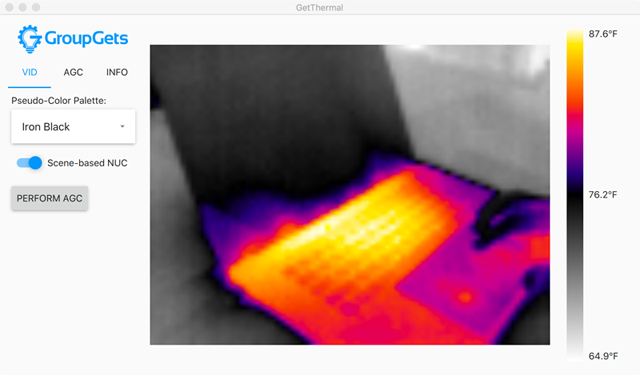 PureThermal Mini is a hackable thermal webcam for the FLIR Lepton (2.x - 3.x) LWIR camera core. It is the result of listening to our thousands of PureThermal 1 users and giving them what they want: four mounting holes, pads for optional EM shielding, less complex circuitry, and perhaps best of all, USB DFU. That's right, a JTAG breakout board will no longer be required to update PureThermal 2. This is a development kit ready to be embedded into a production system. STM32F412 ARM microprocessor. Execute on-board image processing without the need for an external system or SBC. USB UVC works on Windows, Linux, Mac, and Android. Open source reference firmware is on the GroupGets Github. Open source reference image viewer software for Linux and macOS. Powered by USB micro-B cable (included). Device Firmware Updates (DFU) over USB. We've been quietly working on the design for awhile and rest assured, we stuck with the same STM32F4 MCU so yours and our existing firmware will easily port. We can only ship these boards with a Lepton to North America, Australia, and the European Union Countries. Any orders for this product with a Lepton placed in a country other than those will be canceled and refunded. We are sorry for the inconvenience.